For golfers seeking solid core technology for long, straight distance and cut-proof durability. I love reading these reviews... why on earth would a low handicapper play a $15 two-piece ball? These balls are a great value by most standards. The Distance model is indeed too hard for me and doesn't deliver much extra distance. The Soft Feel model is my favorite but the Tour model probably balances distance and stopping power best. Bear in mind that we're only talking about a roughly 10 yard margin between the Distance and Soft Feel balls when hit with a 3-wood by a medium-high handicapper. Don't know if my information is accurate but I've been told by a Titleist employee that these are indeed another, higher-priced (and better reviewed... gotta laugh at that) ball rebranded for the discount outlets by Titleist. Promised not to give the name but it competes in the $23-24 market! Put any of these up against the Rock-Flite, Dunlop, Slazenger, Wilson or Pinnacle balls in the same price range and see what you think. C'mon... it's a golf ball. Great Ball for the price! I used to play ProV1's but I just didn't have the money for them any more. So I now play the HVC Soft Feel balls. Of course they aren't Pro V's, but they are great balls I like them more than the noodle and about the same as the So-Lo but these are 10$ cheaper. These balls give great distance and preform nicely around the greens and can stick very well. BUY THESE BALLS!! I've tried both HVC Soft Feel (70+) and HVC Distance (80+) and they feel totally different. The Distance one gives a decent feeling on Drives and long iron shots, but is definetly not a stopper. The HVC Soft stands by its name and is much softer. Don't get this ball if you're looking for driving distance, but it does feel much better around the greens. The feeling on putts is good too. Now, i haven't tried the NXT balls, but i don't understand how people can compare this to driving range balls...I like them...will the NXT next time to see. The HVC Tours are awful, particularly for the price. My personal fav has been Pro-90s for ages, and when they discontinued those I tried the HVC Tours. It is like hitting rocks and they handle pretty badly. I don't normally give balls credit for my game, but these balls are actually a detriment to my score. You would be just as well off using range balls. Picked these up at Costco. These are real close to the So-Lo that Titleist is all over now. Maybe the same ball repackaged? Soft 70+ compression ball that putts so soft and true. Good distance off the tee and solid control. range balls are cheaper, yet give the same feel. Decent price compared to other models, but they do not preform. I had always used the Nike balls and thought I would try the Titleist this season. I have only played one round with them and found them to be nothing very special. I am not the best at talking about the feel of the ball but this one felt a little "clunky". I don't really have much to compare this to as it is the first time I have used Titleist balls. Did shoot my best round of the year so far with them though. Next to Slazenger Raw Distance, these have got to be the worst balls ever made. 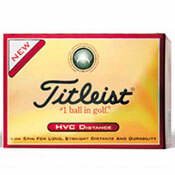 Titleist should be embarassed that their name is on such a bad product. These things are like brass balls, hard as a friggin rock. Absolutely terrible ball. I can hit a boulder with my driver and get a softer feel. These things are like solid titanium balls- harsh feel with zero playability from anywhere on the golf course. I can't believe Titleist would release something so cheap!! !